Our 2018 Home Show season has completed. We did three shows this year; see below for show information and click the headers and links for more information on the show web sites….incuding next year’s dates. Follow us here and/or on our Facebook page for updates and more information. We look forward to seeing you at our 2019 show appearances. 2018 marked the 40th anniversary of the Des Moines Home + Garden Show. and Archadeck was there promoting our deck, porch and patio design/build services for our 21st consecutive year. And, we’ll be back again next year…see you then! We were excited to return to this show after a few years absence..and our excitement was only exceeded by the experience. 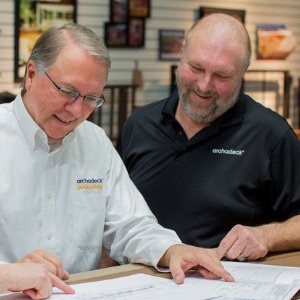 Even without corn dogs, name-your-poison-on-a-stick and politicians, the Iowa State Fairgrounds provided a great venue for a fresh opportunity to showcase our deck, porch and patio design/build services. And, we also helped to find homes for dogs fostered thru AHeinz 57 Pet Rescue and Transport. 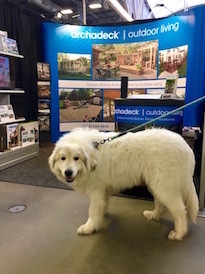 This show was a little more “outdoor living” focused than Marketplace Event’s “big show” in February and was in its 3rd year of providing more information, ideas and opportunities for renewing, refreshing or restoring your outdoor spaces. Archadeck of Central Iowa has had “Outdoor Living” in our name longer than this show has been around, so we’ve been here since the beginning. 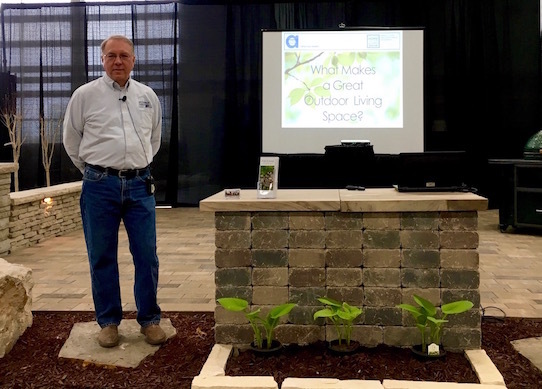 Again this year, we took to the Imagination Stage for a presentation on What Makes A Great Outdoor Living Space and our presentation was well-received. Stay tuned for forthcoming video!